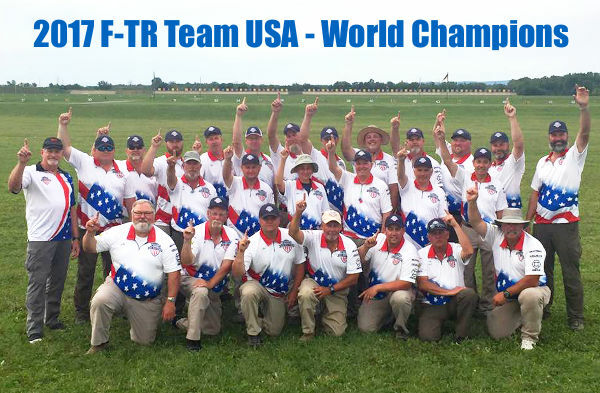 The F-Class World Championships (FCWC) in Canada are just one week away. 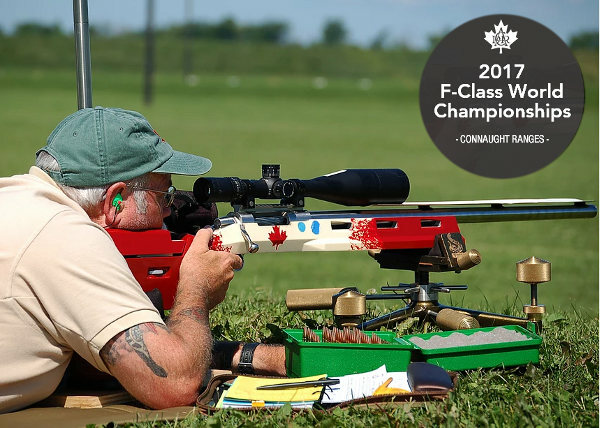 This August 11-17, the world’s top F-Class shooters will gather at the Connaught Ranges outside Ottawa, Ontario. 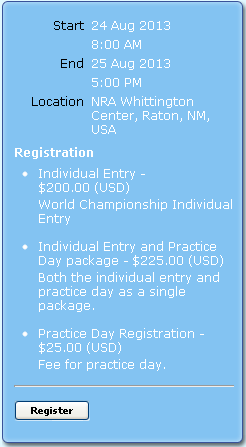 The vast majority of F-Open shooters will be running some kind of 7mm (.284 Caliber) cartridge, with the .284 Winchester, .284 Win Improveds, and 7mm RSAUMs being popular. 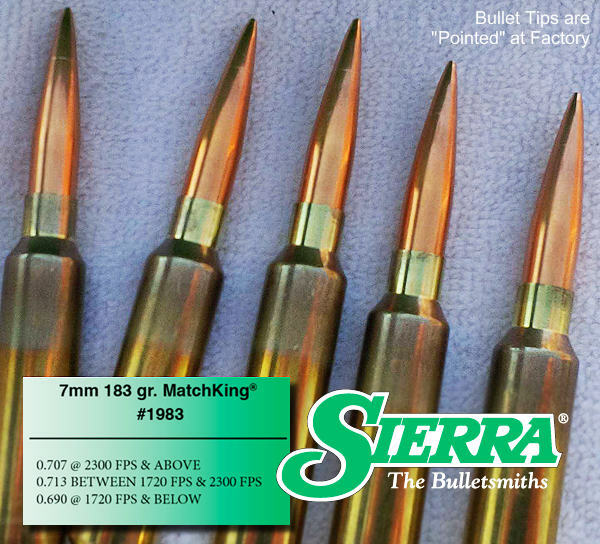 For those of you who plan to compete but who haven’t loaded your ammo yet, you may want to consider a very good 7mm match bullet from Sierra, 183 grain MatchKing (item #1983). We have found the 183gr MK, which comes “pointed” from the factory, to be very consistent in weight and base-to ogive measurement. 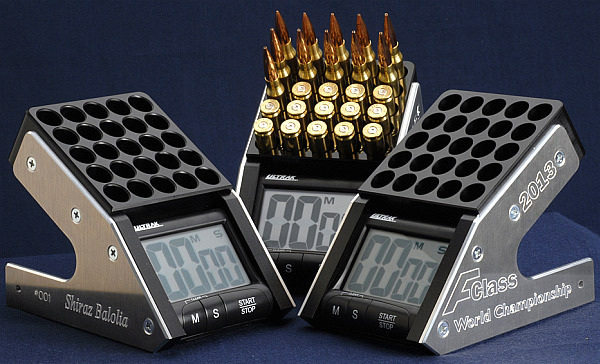 Top F-Open shooters have told us that these bullets shoot exceptionally well, with minimal vertical dispersion at 1000. “Holding waterline” at long range is a reliable indicator that the BC is very uniform from bullet to bullet. In late 2015, Sierra introduced a new 7mm MatchKing® bullet with a different type of ogive. 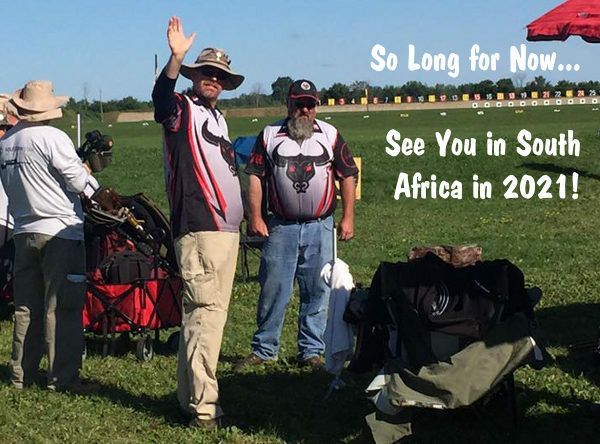 As part of the introduction, I had the opportunity to use them at the F-Class Nationals held in Phoenix with very good results. While at the match, several people had questions about what exactly was different about the ogive on this bullet as opposed to our tried and true blended tangent ogive. So with that in mind, hopefully this blog will answer those questions. In the past, Sierra has typically used a tangent radius ogive design on our MatchKing® bullets. 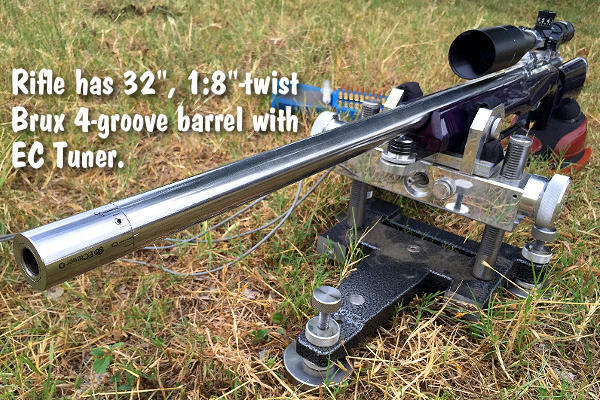 This is one of the most forgiving ogive designs due to its ability to shoot extremely accurately when jumped, as well as, jammed into the rifling. 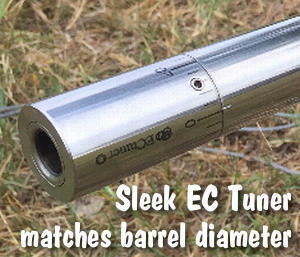 On rare occasions, some of our MatchKing® bullets have used a secant ogive due to design constraints. However, this ogive is much more sensitive to changes in seating depth than the tangent ogive so we tend to shy away from it. 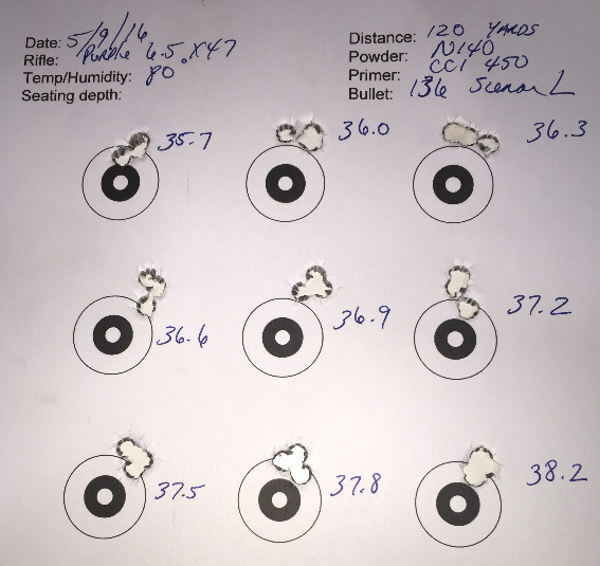 When we decided to work on this new bullet, we wanted to see if we could improve on the accuracy of even our best shooting tangent ogive bullets. One of the main factors of what makes an accurate shooting bullet is how it aligns itself with the bore when fired. 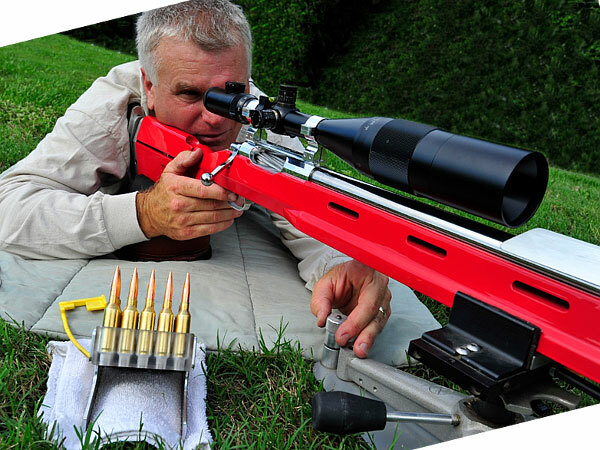 If a bullet is slightly crooked when entering the bore, it will cause inaccuracy on the target. We set out trying to think of ways to make sure that the bullet has no choice but to align itself with the bore perfectly. The first part of the barrel to encounter the bullet is the leade in the chamber. The leade is an angle that is cut into the leading edge of the rifling which helps to guide the bullet into the bore. To illustrate how current bullets fit into the leade, picture a cone (leade) with a ball (bullet) sitting inside it. The ball can be rotated in all directions and the cone cannot force the ball to orientate itself in any particular direction. When a bullet with a radius encounters the leade, it behaves in a similar way. Now this of course is a very simple example and of course advanced shooters use tight necks and brass that is perfectly formed to the chamber to make sure the bullet is aligned as perfect as possible. However, there is always a small element of misalignment that is possible even with all this precise preparation. 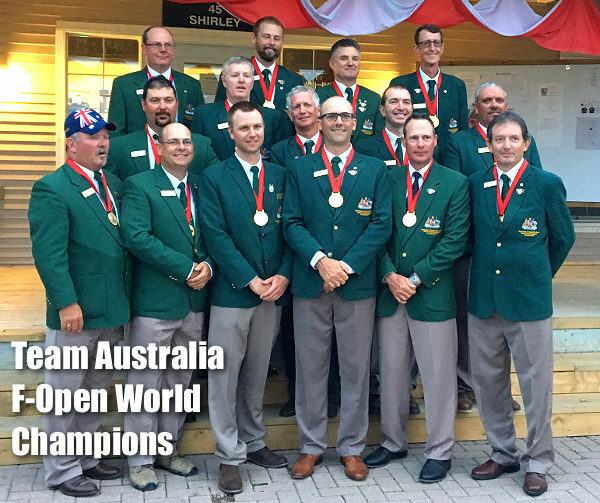 This brings us to the ogive on the new 7mm MatchKing®. We thought instead of using the typical ogive radius that can allow slight misalignment, why not use the same straight angle that is used in the chamber leade on the bullet ogive to force itself to always align with the bore? Imagine the same cone as above (leade) with an identical cone (bullet) sitting inside of it. The cone inside has no choice but to align itself perfectly with the cone that it is sitting in every time. With that in mind, we designed the area of the bullet which contacts the leade in front of the bearing surface using a straight 1 1/2 degree angle instead of the typical radius. 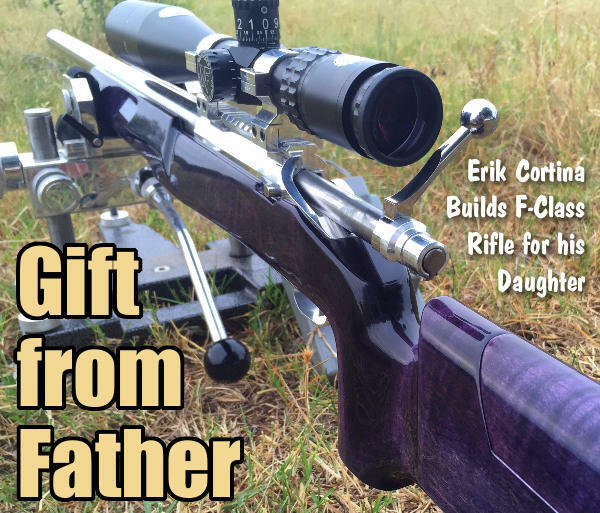 Once past that area, we use a traditional high caliber ogive radius to provide a very sleek, high BC bullet. I hope that explains our thought process behind this new bullet. 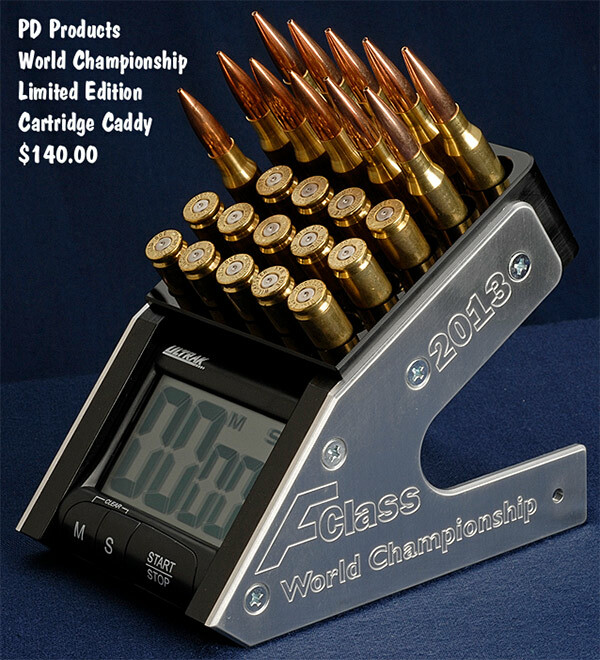 In our testing, it is one of the most forgiving high-BC bullets we have ever made. 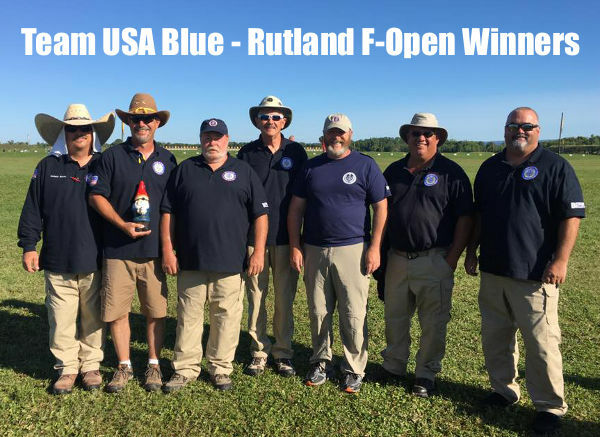 Share the post "7mm MatchKings for the F-Class World Championships"
Gunsmith Thomas “Speedy” Gonzalez recently completed a stunning new F-Open rig for a customer competing at the 2017 F-Class World Championships held at the Connaught Ranges in Ottawa, Canada. The stock is made from multiple layers of exotic and fancy woods. On the outside is Bocote, a super-dense (extra heavy) exotic from Central America. Next comes Birds-eye Maple, while the core (centerline) layer is Wenge wood. Strengthening the laminate are carbon fiber stringers. 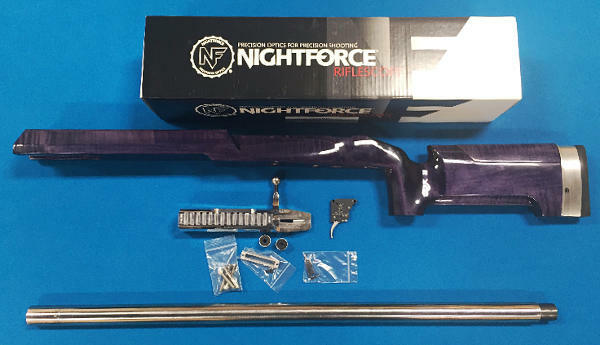 A stock like this can be purchased for $799.00 plus $100 for the exotic wood upgrades. 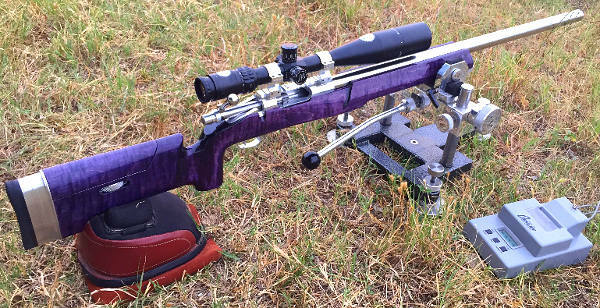 Cerus Rifleworks stock with R.A.D. 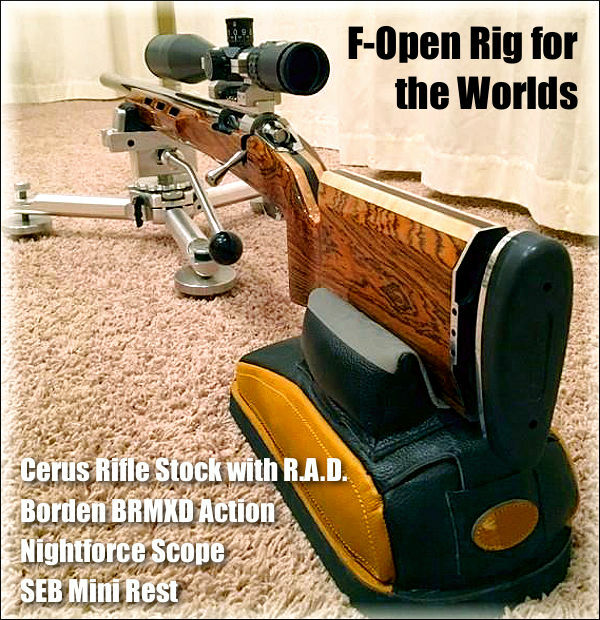 The handsome, CNC-milled laminated Cerus stock features a R.A.D. 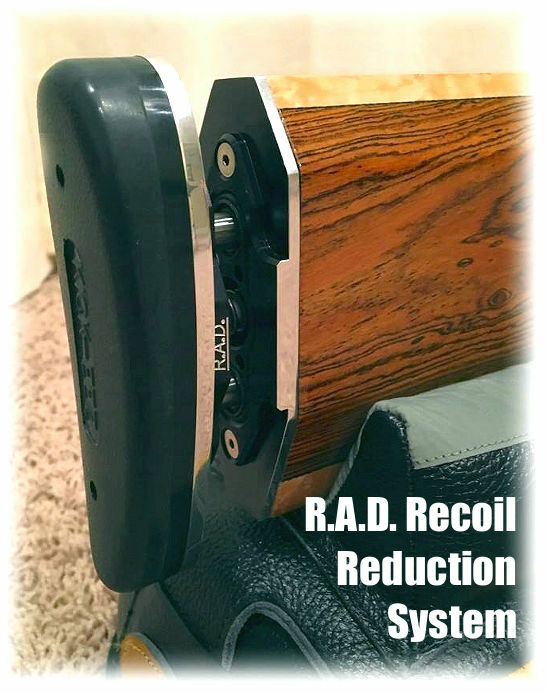 Recoil Reduction System. 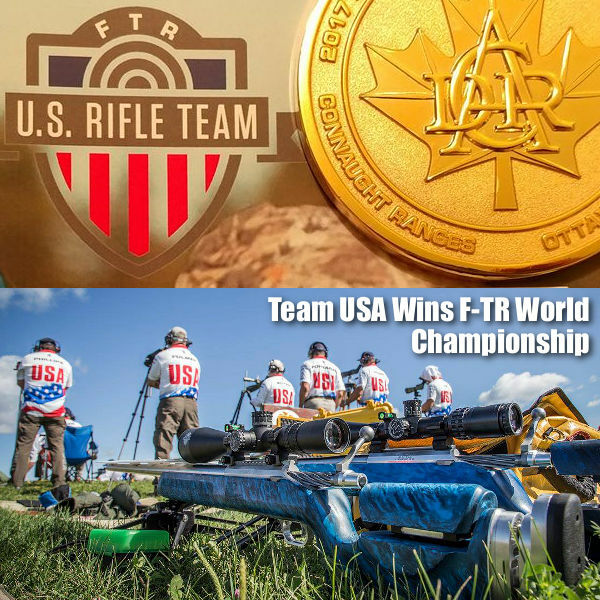 Share the post "Exotic Wood F-Open Rig for the F-Class World Championships"